On average 82 Billion Cubic Meter (BCM) of water is withdrawn from Nile waters every year for irrigation where approximately 8.6 BCM is re-used drainage water in Egypt. An estimated 80% of the irrigation water abstraction in the Nile Basin occurs in Egypt followed by Sudan (about 17% of the total basin-wide abstraction for irrigation). The total abstraction for irrigation in the rest of the Nile Basin countries is estimated at 3%. In most countries, there are no appreciable deficits in meeting the total annual irrigation requirements. 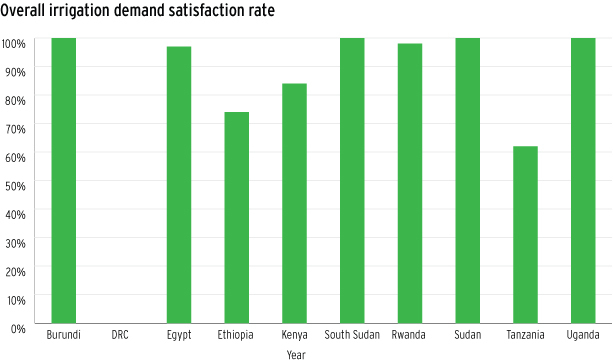 In few upstream countries, due to lack of adequate water storage facility, lower irrigation water demand satisfaction rate have been estimated.